As I promised from my FBS topic, I present to you my concept uniforms for NCAA Division I FCS schools. Like the ones in my previous topic, templates and manufacturers may vary. I'll only use Adidas, Nike, and Under Armour templates, and so, I'll choose what is best for those currently outfitted by Russell, Reebok, or New Balance. 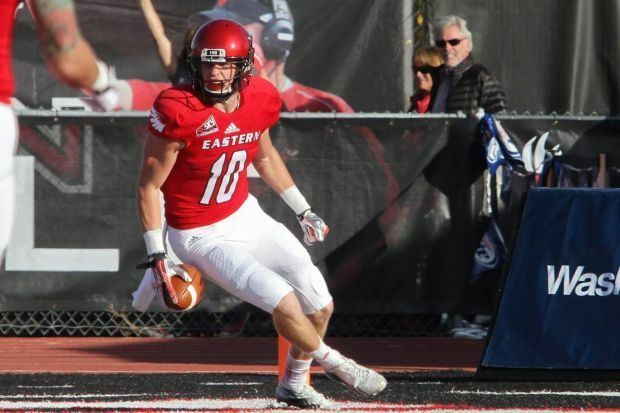 The teams that will be included here are the ones in the FCS lineup after the year 2020, which means that North Alabama (Big South) and Idaho (Big Sky) will be included here. But before I go to the first school, I wonder why the insert media feature (the one with the paper clip icon) is missing? Beyond excited for this. Super happy you are back and delivering on your promise! Can’t wait to see concepts. Perfect timing as well! I’m on my way to an FCS Playoff game as I write this! It got taken down...but by the time you read this, you might know that already. You'll have to use Imgur or Flickr or something. I'm not really a fan of the Mustangs' Adidas uniform design, although I somehow applaud it for being "basic". With that, I took the inspiration from their pre-Oregon State-style Nike uniforms, and retrofitted the design to Primeknit. I also added gold (or beige?) and black jersey options. Sometimes, less is more. This was the case for EWU. 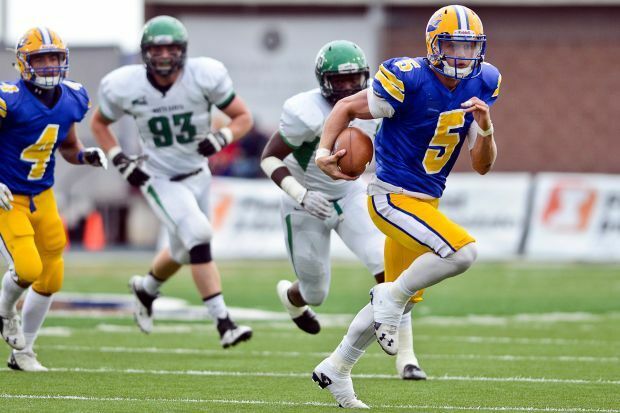 I think that their current basic uniforms are one of the best in FCS. The only problem I have with those uniforms is that the numbers are too condensed. I fixed that with slightly widened and un-italicized numbers. Other than the different positions of TV numbers and the athletic logo on the tops, as well as a recolored logo for black helmets, there are no significant changes in these concept uniforms. Good start. My major complaint, as I was a long-time lurker on your FBS series, is why does almost every team in your universe have a yellow, gold, black, or gray uniform? It's very pointless for many teams. While I tend to agree that in the FBS series there were a few like this, both CPSLO and Eastern are teams that use black as a major part of a color scheme. 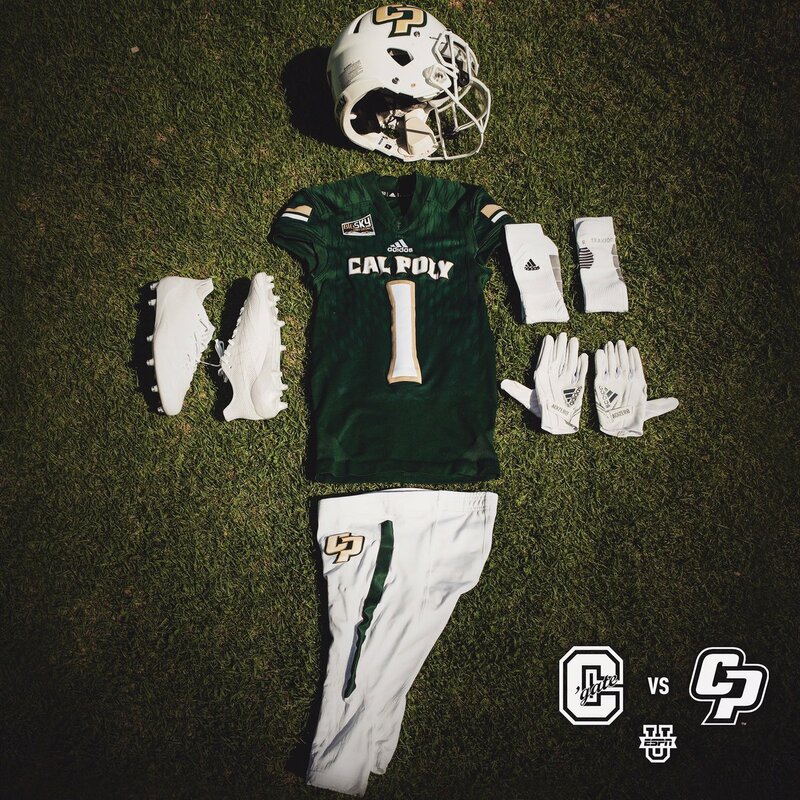 I remember Cal Poly broke out an all black uniform for the playoffs in 2012(?). Eastern also uses black mostly due to the fact that their players would get lost in the “Inferno” if they wore red constantly. Great start! Cal Poly looks great, no complaints. Love the white helmets. Same with EWU. I like the all black look. IMO, the ones you created are better then the ones the Eagles use in real life. I wasn't really referring to these two. But does Kansas State really need both black AND gray alternates? They work perfectly fine with neither. True. Black doesn’t need to be a K-State color. Gray is okay, as it is one of their secondary colors. I don’t love it but don’t hate it. Just IMHO. I understand where you are coming from 100%. To answer your conversation, I'm actually a sucker for BFBS. I did a black uniform for K-State back then, because of K-State's real-life basketball uniform set, which included black uniforms. Anyway, let's move on. Spoiler Alert: Both Montana and Colgate will have gray alternates, since gray is one of their main colors. 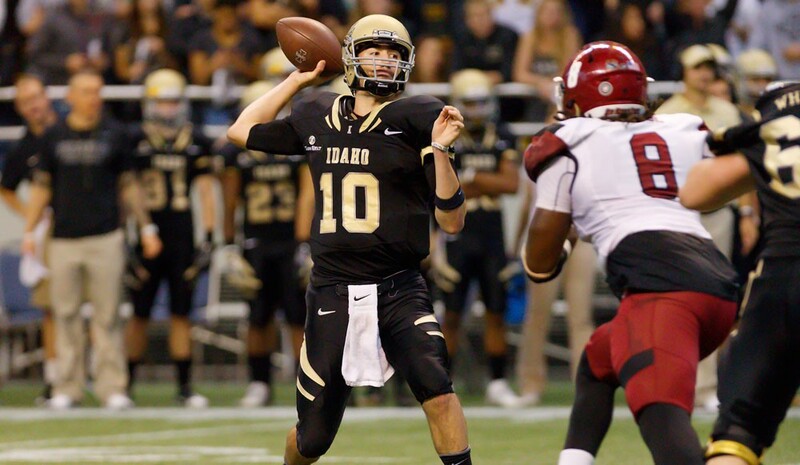 So Idaho goes back to FCS... For me, that means a new era for their uniforms. Gone were the days of the very ancient Cal-based Nike template (although they have new white jerseys for 2017), and enter the Vapor Untouchable. I added more silver onto their uniforms, but it's limited as accent and TV number color. I really like what you did with the silver in Idaho’s color scheme. They often overuse it as an accent color. I like both helmets. Montana has such a crazy amount of helmets. I can recall at leadt 5 that they have used at least a few times. I think I like the idea of a gray MT uniform. To answer your conversation, I'm actually a sucker for BFBS. I did a black uniform for K-State back then, because of K-State's real-life basketball uniform set, which included black uniforms. Idaho looks stellar. I don't really like silver and gold coexisting (see Colorado, and I know that's an unpopular opinion), but this is done in a very tasteful way. Love the helmet script. No significant changes were made here, except for the new number font and the inclusion of TV numbers and bengal head logos. Also, the orange helmet becomes the main helmet, thus relegating the white helmet to alternate. Good work, but the jersey feels just a little too plain. I feel like the three-stripe motif should be used somewhere. Nice work, but it looks too much like the USF Bulls for me. 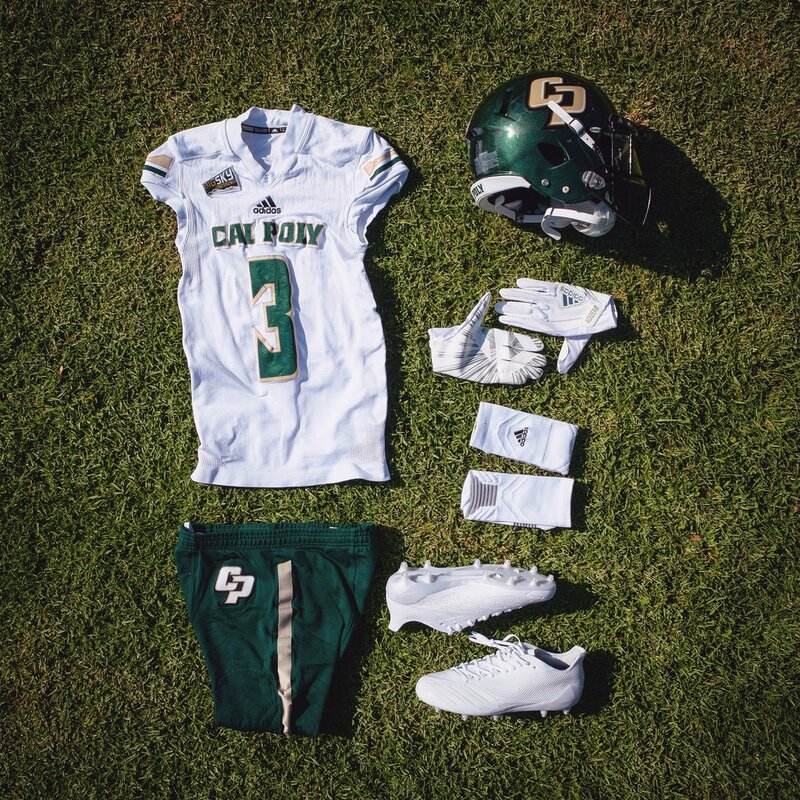 This has been Cal Poly’s identity for years. Nice work on the Idaho schools. The first thing that came to my mind for Montana is to get rid of almost 1,000 helmet designs, and leave only four behind. Aside from the regular maroon, white, and silver sets, I also brought a fauxback set to the mix. Gone is the black...well, not necessarily gone at all, because black has been limited to wordmark and number trim color. For the Bobcats, I went to a throwback-inspired overall look. I used their current shades of blue and gold because, first, I like this color palette, and second, both Northern Arizona and Northern Colorado already use almost-identical shades of blue and gold, and I don't wanna go overboard for Montana State by going for their throwback colors.